Win Nicky Clarke's DesiRED 2000W AC Dryer worth £39.99! The new DesiRED collection from Nicky Clarke helps you to achieve that salon perfect look - at home! Using the very latest in technology, the new and improved DesiRED range is all anyone needs to achieve that gorgeous salon worthy hair, at home! 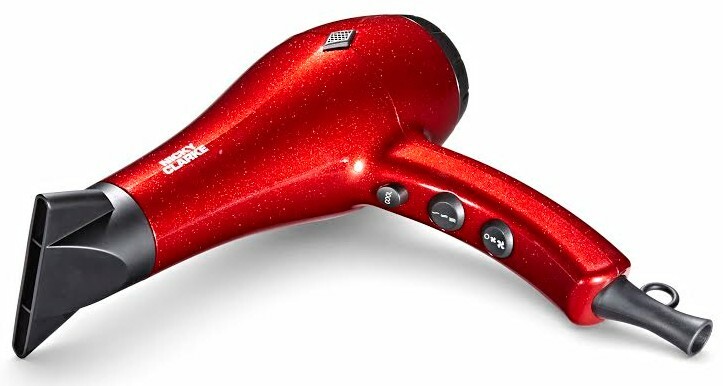 Styled in luxuries red sparkle finish, the new DesiRED range excludes quality, class and elegance. Whatever your needs, the DesiRED range will ensure your hair has that salon perfect style! The state-of-the art range, released in September 2015, is the next generation of the DesiRED range, Nicky Clarke's best selling range, and have been updated using ceramic black pearl for a smoother finish, and Moroccan oil for a desirable, luscious shine! The unique, ultra-high spec technology provides salon performance at home, along with a range of features that make this the perfect tool to get your favourite celebrity style! Technology helps to control frizz, the dryer has 3 heat settings and two speed settings for maximum versatility, a cool-shot button to add the finishing touch to enhance any style, a removable air filter and a professional styling concentrator! Nicky Clarke has very kindly put aside one DesiRED Dryer for one of my lucky readers/visitors to win! Other items in the range include DesiRED Straightener and the DesiRED Wide Plate Straightener! The range brings salon standards and red carpet glamour to your home, because we all want to be Desired! Available to buy from Argos for £39.99. Please note: You must at least follow or like Unique Young Mum and Nicky Clarke on at least one social media platform! To find out more about Nicky Clarke, and to view the full range of products, check out the official website here.